Fast-moving and innovative social movements are rising around the world. Many of these share goals with Greenpeace and other campaigning organisations. We see this in Occupy and Black Lives Matter in the U.S. We’ve experienced it with Ayotzinapa in Mexico, the #LeyMordaza fight in Spain, Brazil’s anti-World Cup movement, the Sunflower movement in Taiwan and many other popular campaigns for social change. When does it make sense for groups to interact with new movements? Can campaigning organisations engage with, and help, rising movements to expand one another’s networks and scale impact? And how do social movements benefit from the involvement of larger organisations while retaining their independence and vision? Greenpeace and many other organisations are wrestling with these questions—as are growing movements around the globe. 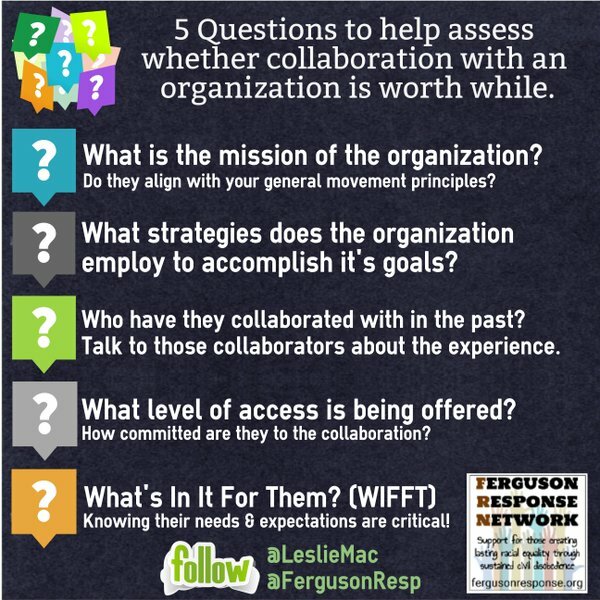 Common goals: For collaboration to happen, there has to be some alignment around why you’d even want to collaborate. Think and work together: Everyone has to be part of both coming up with the “what” as well as putting it into effect. Groups can play different roles, but it has to be done together. Take advantage of each others’ strengths: Some groups are better than others at some things (legal, direct action, comms, whatever it is) — use strengths to your advantage, and let groups do what they’re best at. Frequent, open communication is absolutely vital to building and maintaining trust within any group. Alba Villanueva is a journalist specializing in social communication, and has been deeply involved in the #NoSomosDelito movement, including organising broad-based actions, communicating with the public, and behind-the-scenes movement building. She has appeared frequently in community media (local radio & TV) and has been prominent in the social economy movement in Madrid.